Recently I went to a celebration of Italy’s National Day, La Festa della Repubblica, celebrated on June 2 every year. The day commemorates the referendum of 1946 when the Italians voted for a republic rather than a monarchy. This year’s celebration at the Trade Commission in New York showcased Italian delicacies. In addition to cheeses, charcuterie, chocolate, fashion and design, wine was part of the offering. The wine they selected and paired with cheese was Torcolato from Veneto producer Cantina Maculan. I first tried this wine in 2000 during my first Associazione Italiana Sommeliers class in Milan. I will never forget the experience of this rich and luscious example of an Italian sweet wine. Again this month, I marveled at its beauty and power. Torcolato is made from indigenous variety Vespaiola that has been affected by noble rot or botrytis. The grapes are dried for four months before they are fermented. In the Veneto, making this wine, means winding twine around the bunches and hanging them from the ceiling. This is where the name comes from as well, because in local dialect, torcolato means “twisted.” After fermentation, the wine spends one year aging in barriques and then six months in the bottle before it is released. It is a perfect wine for dessert or cheese, not overdone or unctuous, but smooth and delightful with honey, apricot and dried nut aromas and flavors. 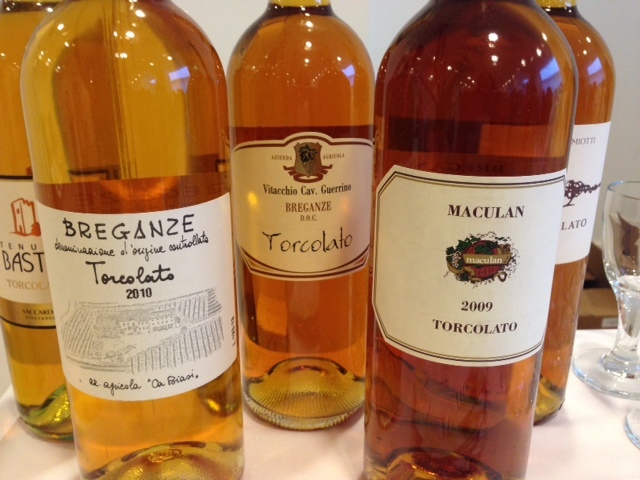 Maculan makes a series of incredible sweet wines that all merit a taste. This one has particular significance for me however because of fond memories. If you haven’t tried it yet, definitely put it on your bucket list. It is available from Winebow.